Reporter, news editor, and public affairs director at WRKO for 29 years, Roger was also a professor at Curry College for 30 years. Many Massachusetts broadcasters have also taught in our colleges and universities. 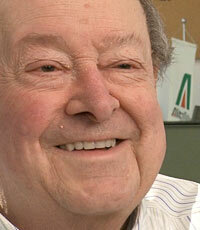 But few can equal the impact of Roger Allan, reporter, news and public affairs director at WRKO for 29 years. Roger, who’s real name was Roger Bump, was also a professor at Curry College for 30 years. To quote one of his students, Jordan Rich: “Roger did more than simply lead us in class. He worked with us at the school station and helped many, including me, land our first professional jobs. He knew nearly everyone in the business and nothing seemed to bring “Uncle Rog” more pleasure than connecting folks and seeing those connections lead to successful careers. Many hundreds of professional careers were launched by this caring and loving man.